I'm now trying to get into the swing of Christmas cooking. This is the first time I've ever hosted Christmas for the family and it's a really big thing for me. In my head, I know exactly what I want to cook and how things will go. In reality, it will probably be a total disaster - although I must stop pondering that in case it turns into a self-fulfilling prophecy. When I was younger, I was classed as fussy by my family. My mum readily reminds me that when she weaned me, I'd eat literally anything. That morphed into eating anything so long as it had mint sauce on it. Then I learned to say no and became fussy. The last bit of knowledge is a recent revelation. For many years, she led me to believe that I got fussy when I went through my 'I-will-only-eat-crunchy-peanut-butter-and-celery' phase. But she's finally conceded that I got fussy when I learned to say 'No'. I think she's now realised the level of frustration I've reached since Miss A learned to say 'No' and how useless I feel that my daughter will only eat cheese and fruit despite my attempts to maintain her once cosmopolitan palate. My family think I'm fussy because I don't eat pork and lamb and will absolutely not eat offal or tomatoes that have the slimy insides in. They still don't quite know me as well as they think they do. I won't eat pork or lamb that's been roasted to within an inch of its life and is covered in layers of chewy fat and gristle. In the same way that at lunch today at work, I failed to finish my chilli beef soup on discovering a piece of solid fat floating halfway down the bowl. Visible meat-fat in food turns my stomach. Likewise offal. The only time I remember being offered offal at home as a child was when my mum used to make stuffed hearts and they stank the house out. And kidneys that tasted of wee spoiled the lovely sausage-y dish otherwise known as Kidneys Turbigo. I love coating liver in flour ready for frying but once it resembles a slab of concrete, it somehow loses its appeal. All of the above are enjoyed by most of the people I'm cooking for (my mother, grandfather and stepfather). The other guests (the husband and Miss A) only eat cheese, fruit, fish fingers and chicken kievs (the husband). On my list of things I would cook for my imaginary family are: sprouts with bacon, pancetta and chestnuts; Jamie's Get Ahead Gravy; citrus basted Turkey; mulled cider; orange crust mince pies; clementine curd; red onion marmalade; ham in coca-cola; and Dame Mary's Christmas chutney. All of which will sound lovely to most, but I can guarantee you that not one of them would go down well with the family. They don't do sweet and meat. They like traditional Christmas cake or Dundee cake. The husband will only eat shop-bought mince pies. And what's wrong with boiled-to-death sprouts and Bisto? Ah well. I'm going to indulge myself with some practice anyway. 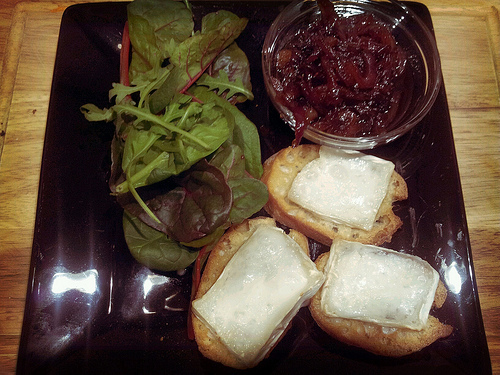 Today's was red-onion marmalade, served with goats cheese crostini. The recipe for the marmalade came from Leiths Simple Cookery. Very tasty, but when it was cooking, I thought I was going to suffocate from the fumes from the wine and the onions. Luckily it was tamed by the addition of the honey towards the end. Makes for a very tasty, light snack and I can see it being applied to a cold turkey sandwich on Boxing Day which I shall enjoy whilst everyone else just has turkey and butter in theirs. Heat the oil in a pan over a medium heat and fry the onions until they start to soften and caramelise. Crush the garlic clove and add to the pan. Fry for 30 seconds. Stir in the sugar and continue to heat for two minutes until the onions start to caramelise. Add the wine and cook over a medium heat until almost all of the liquid has reduced. Stir in the honey and season to taste. For the crostini, I brushed slices of ciabatta with olive oil then baked at 200C (fan) for 5-7 mins. I topped with slices of goats cheese and returned to the oven for five minutes until the cheese melted.